During the 2015 Annual Scientific Meeting, Academy members conducted an Evening Session entitled “Keep It Simple, Stupid.” Topics included Knowledge, Investigation, Sharing, and Spirit (ethics); to add a bit of whimsy, the panel dressed in authentic KISS costumes. 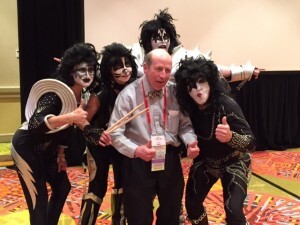 Afterward, members of the audience who wished to have photos taken with the “KISS” presenters were asked to make a donation to the FSF Warren-Young Scholarship in any amount of their choosing. In all, $700 was donated for the scholarship fund which is designed to encourage forensic science education at the middle and high school level. 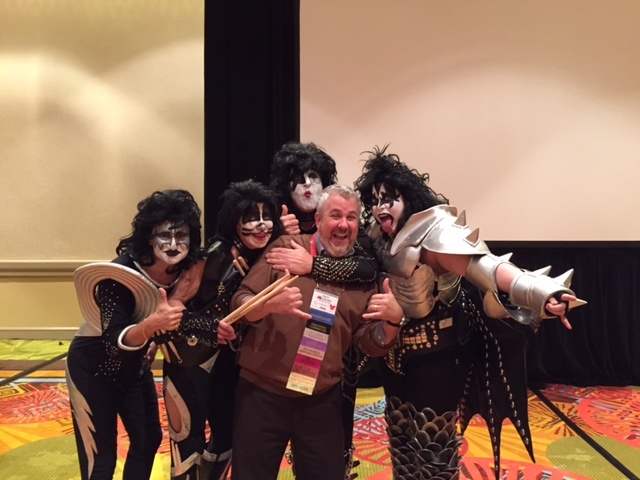 Below are photos (l-r) of Dr. John Young (Psychiatry & Behavioral Science) and 2014-15 President Dan Martell with “KISS” presenters. Thank you to those who participated in the impromptu fundraiser in Orlando, and thanks to everyone who has contributed thus far! The announcement of the first winner of the FSF Warren-Young Scholarship, Nancy Iaukea, may be found in the AAFS News Feed.